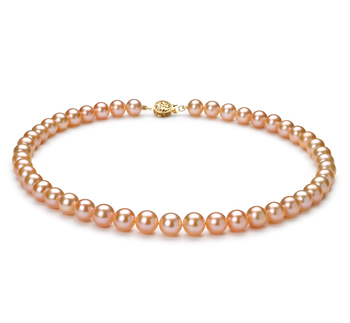 Did you know that a pink Freshwater pearl necklace can really flatter all kinds of figures. But with so many different styles of these necklaces to choose from how can you decide which one will suit the outfits that you would love to wear it with. Well we are going to offer a few tips below so that when it comes to buying one of our beautiful pink Freshwater pearl necklaces, you select the perfect one. One that won’t just suit your own particular fashion style but also your body type. 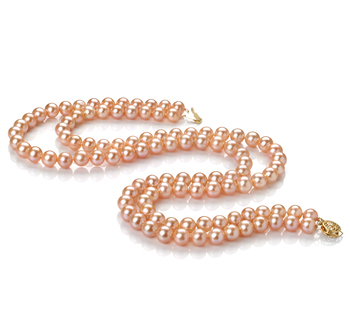 As you will see pink Freshwater pearl necklaces come in a variety of different lengths. If you choose the wrong kind of necklace of course it will end up making the outfit look all out of shape. The perfect necklace should be one that compliments the neckline of the outfit you are going to be wearing. 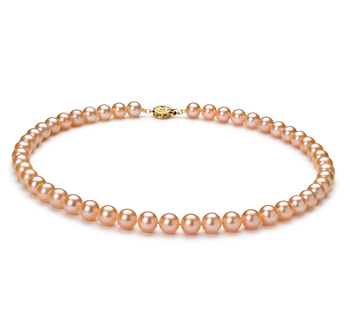 Ideally choose a pink Freshwater pearl necklace that will compliment outfits that you wear on a daily basis that you already have in your wardrobe. Ideally you should wear a long pink Freshwater pearl necklace with any outfit that has this style of neckline. Such a necklace will help to make the ensemble look for elegant and will help to draw people’s attention away from your neckline. If you love to wear outfits with this style of neckline you need to look at wearing a shorter pink Freshwater pearl necklace. But you need to avoid any kind of pink Freshwater pearl necklace set that has a necklace that sits right at the top of your shirt or dress. What length of necklace you we are with this will all depend on how you like to wear this style of shirt. Such shirts are very versatile and won’t look out of place when worn with necklaces both short and long. If you intend to wear your shirt buttoned up then of course a long pearl necklace that sits over the top would be perfect. 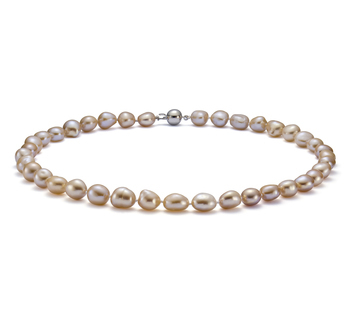 However if you prefer to wear such more casually with a number of the top buttons open then a short or medium length pink Freshwater pearl necklace would look amazing. 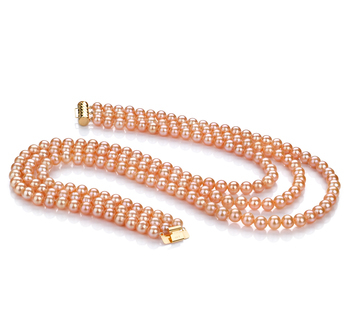 There are a number of things that you will need to keep in mind when deciding on the kind of pink Freshwater pearl necklace set you should buy. How tall or short you are, how slim or fuller you are will all determine the length and style of necklace you should wear. 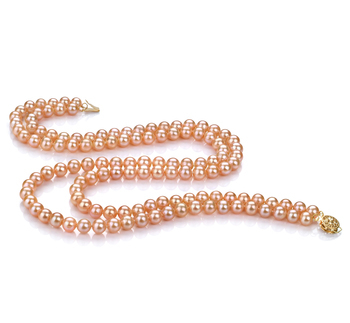 For women who are 5’6” or taller they will find that pretty much every kind of pink Freshwater pearl necklace we have in our collections are suitable for them to wear. For women who are very tall they can wear a necklace that will drop down to their naval or just slightly below their waistline. 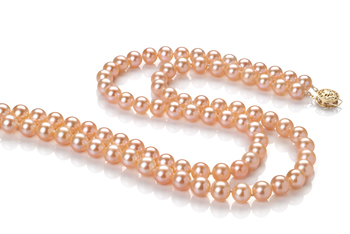 Taller women should look at wearing a pink Freshwater pearl necklace that is longer than 20 inches. So the ideal kind of pink Freshwater cultured pearl necklace they choose to wear should be an opera or rope style necklace. The length of this necklace will help to create the illusion of shortening their body so they look shorter than they really are. 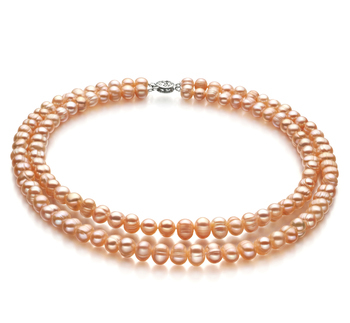 For women who are 5’2” or shorter and are quite light framed will need to be careful when it comes to choosing a lovely pink Freshwater pearl necklace. They should avoid wearing necklaces that look heavy and stick to wearing shorter length ones. The ideal length of necklace for such women would be a princess style necklace so one that measures no more than 18 inches in length. This type of pink Freshwater necklace will sit at mid-chest level. They may also find that a choker looks stunning on them. It should be one that sits just above their collarbone as these look more flattering and will help to make them look taller. For women who have a lot more curves then going for bolder structured necklaces or pieces of jewellery is a great idea. 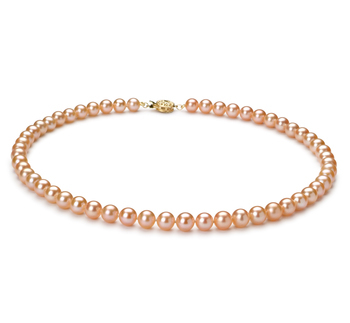 They should look at wearing a collar or cuff style pink Freshwater pearl necklaces. Ideally they should go for ones that are in more vibrant pink colors rather than more muted ones. Plus size women will also find that they can wear a longer more delicate style of necklace, as it will help to accentuate their bust and high waist more. Plus size women will find that people won’t be so focused on how they look but their eyes will be drawn down towards the amazing set of pearls they chosen to wear. 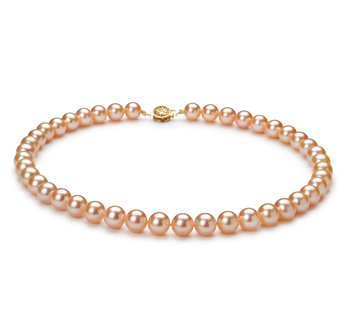 When you thinking about buying any one of our pink Freshwater pearl necklaces you will see with have a wide array of different styles and lengths to choose from. But if you keep in mind what we have suggested above you will end up making a more informed decision. When it comes to buying any kind of necklace even a pink pearl one choose one that doesn’t only flatter for your figure but the outfit it will be paired with. 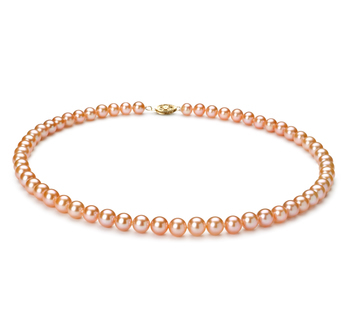 If you choose a pink Freshwater pearl necklace that fits both your body shape and style then others will notice it. Your friends are going to start realising that there is something special about you. You will also feel more confident and comfortable in the necklace that you have chosen because it feels so unique to you. Every woman who understands how a necklace can really accentuate their looks and their attire will feel more confident. This in turn won’t only allow the beauty of the pearls they are wearing to shine out but also their personality as well.